Based on the success of my Jolly Rancher Vodka experiment, I decided to try something involving a soft candy for a change: Marshmallow Vodka. 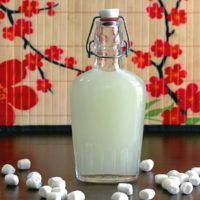 There aren’t many marshmallow liqueurs out there, after all, and a successful marshmallow vodka infusion would be just that. I considered a couple of possible methods, based on what I’d learned from the hard candy infusion from last month, the infamous Skittles Vodka infusion and vodka gummy bears. I found that both methods worked. Basically, the first leaves out straining, giving you a more syrupy and sweet infusion. 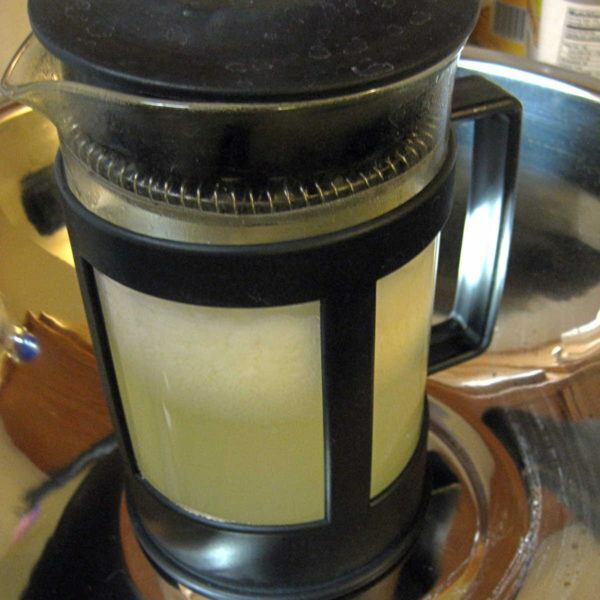 The second method uses some straining and results in a lighter, less sweet concoction. If you found the other candy vodka infusions too sweet, you’ll love the results of the French press method I describe below. For marshmallow vodka, there’s no need for exact measurements. If you want to strain, and didn’t use a French press, you’ll need a tea strainer, possibly some cheesecloth and a container to strain into. A flask or bottle – I use the Bormioli Rocco flasks from Amazon. Chop up some marshmallows into small pieces. Even if you’re using little marshmallows, this whole process will happen a lot faster if you chop them to expose the inner gooiness, because the vodka is slow to eat through that slightly tough outer shell. I actually didn’t do this step until later in the process, when I realized how long it was taking. In hindsight, I would still use big marshmallows, because they’d be easy to chop into very small pieces with lots of exposed inner gooiness, whereas the little ones are mostly shell. Once you’ve done that, put your marshmallow pieces into a lidded container. Fill it up completely with them. Pour vodka in over them – there’ll be plenty of room. Put the lid over them and wait. You can occasionally shake or stir your results to speed up the melting of the marshmallows. I actually used my French press for this step because I anticipated I might want to strain it. A French press lets you brew coffee right in the hot water, then press down the grounds and trap them, so it also works great as a strainer. 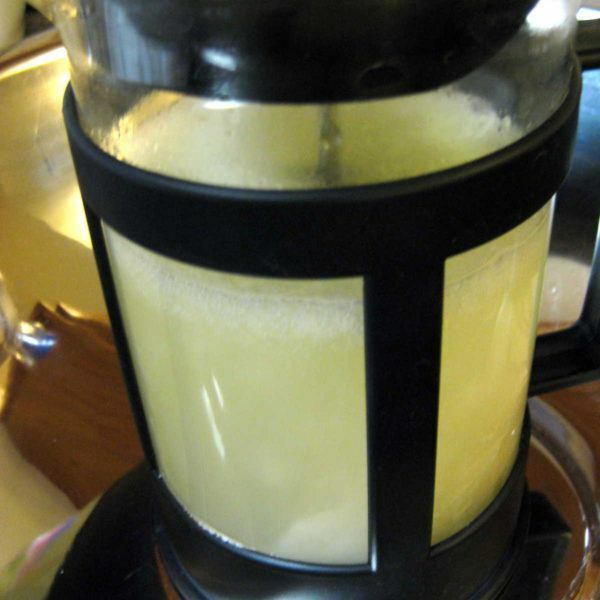 Reader Neil Hines reports that a Vitamix will give you much better results, and given what I’ve heard about them, I don’t doubt it. I had to leave mine for twenty-four hours, but I suspect if you chop up your marshmallows beforehand, it’ll be a much shorter wait. At some point, the marshmallows will be as thoroughly dissolved as they’re going to get – the vodka can only take in so much. You end up with a floating layer of marshmallow on top (see picture). Now you can use a spoon to push aside the floating layer and get a taste of what’s below it. If you like the taste and texture, you can just skim off the marshmallows that didn’t dissolve, and enjoy your creation. All done! If you find it a bit thick and sweet at this point, continue to the next step. If you used a French press, straining is as simple as pressing the top down (I also put my French press in a big bowl, just in case anything leaked, but there wasn’t a drop). The press catches a surprising amount of the visible gunk and takes out some of the dissolved particles of the starches. Skim off any visible chunks/floating layer of marshmallows with a spoon. No point straining what can be spooned out. 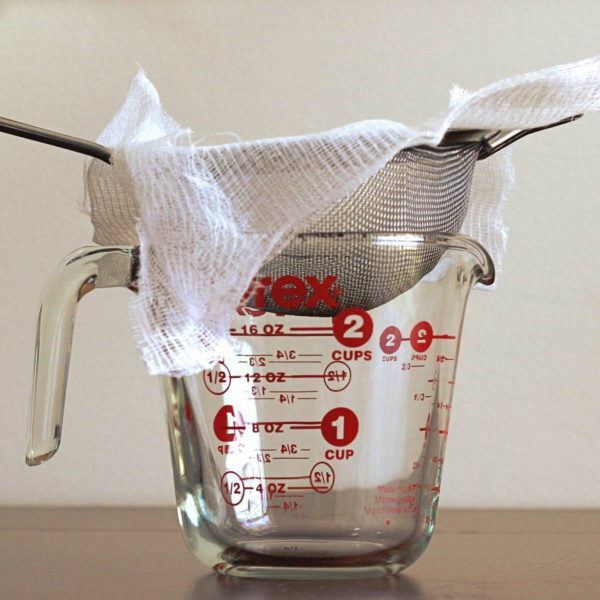 Position a tea strainer across a mixing cup, and put a cheesecloth over that. Pour the infusion through that, a bit at a time, and it’ll collect some gunk. You may want to strain it multiple times if you didn’t use a French press. Whatever you do, do not use the coffee filter straining method from Skittles Vodka. For some reason I can’t explain, the marshmallow vodka just drips through it for a while, then stops altogether. I would’ve thought Skittles had more substantial crap in there to filter out than marshmallows do, but whatever the reason, coffee filters just don’t work on this one. It’s generally agreed that most forms of vodka are better chilled, but the flavor of this one at room temperature really surprised me, so you may want to try it both ways and see what you like. Note that if you leave this drink sitting around in its flask or bottle, some white stuff settles to the bottom and the top turns more clear. Just shake it up before serving. This drink is actually very good straight, as a Marshmallow Martini. The marshmallow flavor is there and identifiable as marshmallow, but it’s not overwhelming like the candy infusions. It’s sort of light, and far less sweet than I expected – less sweet than Baileys, for example. So you could definitely just drink it straight up, or drop a maraschino cherry in- the cherry falls to the bottom and soaks up the flavored vodka while sitting there making the drink look pretty, and then you finish by eating the cherry. It’s a delicious finish! 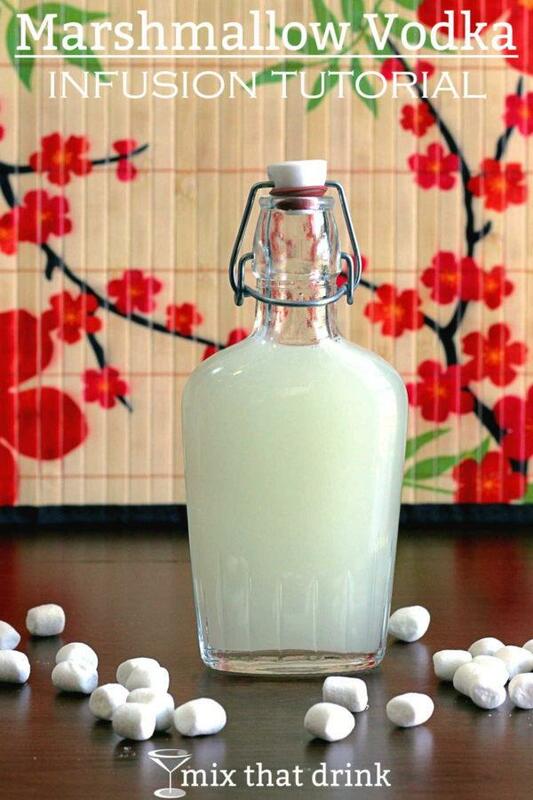 Marshmallow vodka can definitely substitute for vanilla vodka in any cocktail recipe, since marshmallow is basically vanilla and sugar, after all. It should also work in most cocktails that call for Baileys: while it’s not the same flavor, it’s a similar type of flavor. 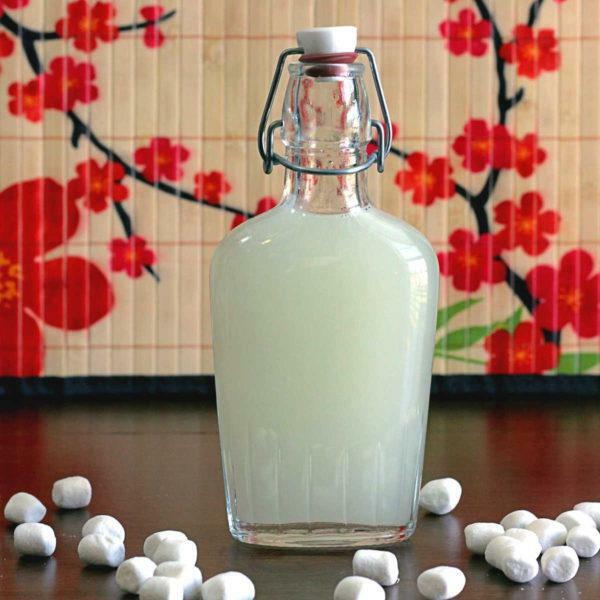 DIY Marshmallow Vodka is a delicious infusion that tastes like marshmallows – vanilla and sugar. It’s sweet but not too sweet. And the feel of it in your mouth – unlike a clear, store bought version – is silky. It’s almost like a cream liqueur. Chop up marshmallows into small pieces (this speeds up the process). 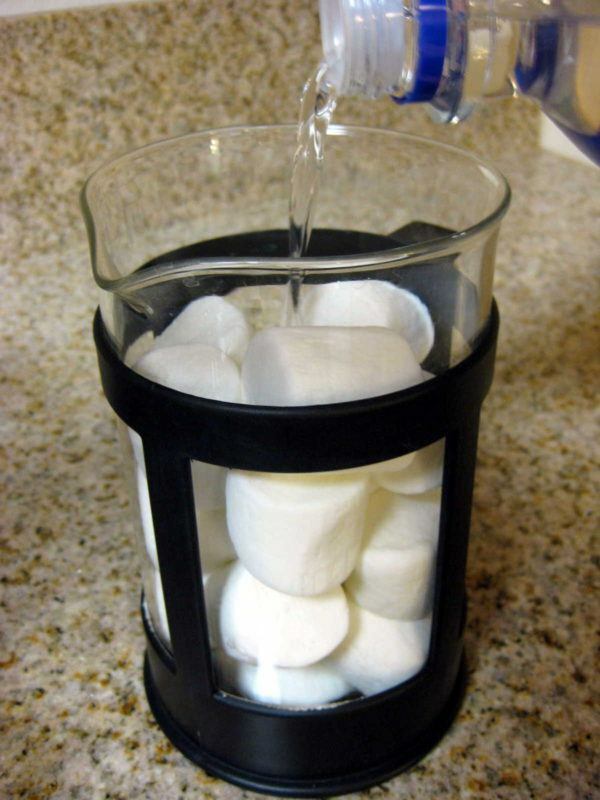 Put marshmallows into a French press. Pour vodka into the press over the marshmallows, until full, and set aside for at least 12 hours, possibly 24. Now that the marshmallows have melted into the vodka, spoon out the layer of white residue that has formed on top of the liquid mixture. Press the plunger on the French press to strain it some more. 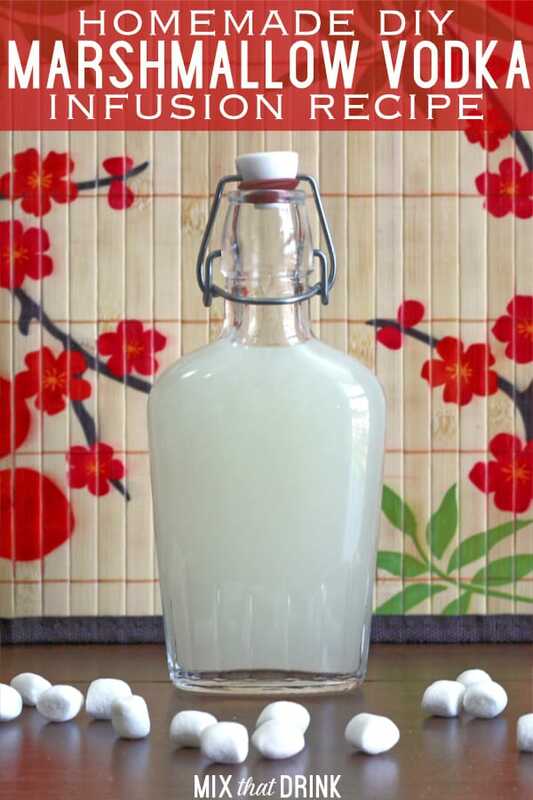 Pour the mixture into a flask or other closed container for storage. It should keep for some time in the fridge - I've kept it up to two weeks with no problem. What an original cocktail idea. I would never have thought of using marshmallows this way. How did you get the red bit at the bottom? Is it another liqueur or a dissolved gummi bear? I’m going to look at your link to vodka gummi bears to see if that tells me. Like I said in the post, it’s a maraschino cherry. Brilliant! What a great idea for Fourth of July! Have you thought of using marshmallow creme? That’s a good idea! I’m marking it down. So have you named the drink at the top yet? 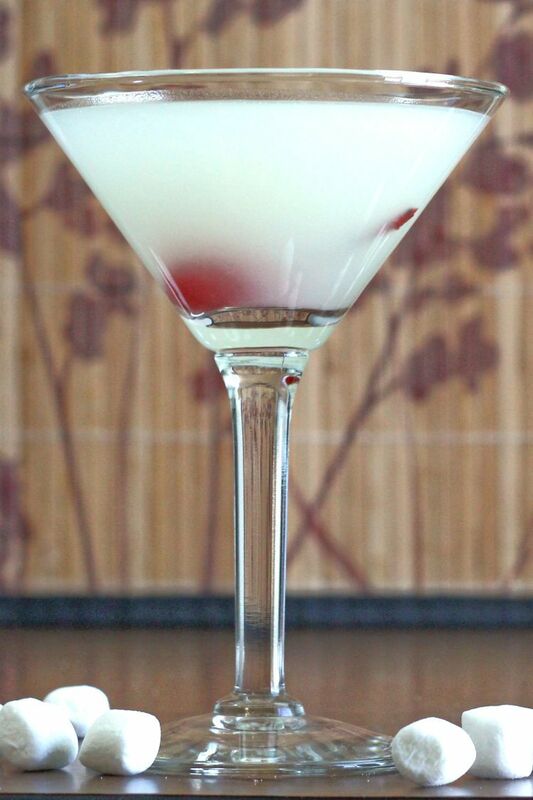 Personally I think “Marshmallow Martini” would offend a few purists. I would consider calling it the “Shuttlecock” since it looks, well like a shuttlecock. It’s the birdie they use in badminton, for those who don’t know. Have you thought of cotton candy, candy corn, m&ms, jelly beans, or caramel? I made candy corn infused vodka for my hubby for Christmas last year & he loved it! He would just drink it straight up. Awesome! Can’t wait to pick up some vodka tomorrow & try some of your recipes! Thanks! How long did the finished product last? It lasted a couple of weeks before I finished it. :D I don’t think there’s anything in it that would go bad for at least a month or two, but I haven’t kept a batch that long. Liquid marsh mellow doesn’t sound like my thing. But you might be able to a S’more like drink using Poke as stir sticks, or those edible cereal straws. 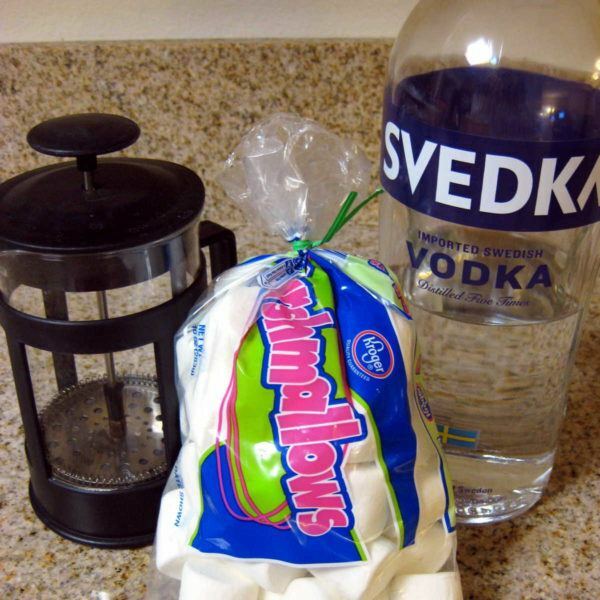 I just bought some marshmallow vodka yesterday and can’t wait to create a “S’more-tini”. I’ll dip the rim in Nutella, then graham cracker crumbs; next mix marshmallow vodka and a small bit of Jim Beam (for charcoal-roasted flavor). If anybody tries it before I do, let me know how it is and what improvements you make. I made some smores-tinis on new years eve with marshmallow vodka, chocolate liquor and graham cracker crumbs on the rim. They were a big hit! I used store bought marshmallow vodka but I will be making this for the next round for sure. Thanks for sharing! I just thought of a great drink to make with this!! A s’more type drink!! just add a chocolate liqueur and put chocolate syrup on the rim with some graham cracker crumbs!! How big was your french press? Has anyone found a good source for the flasks besides Amazon? They are $8.50 a piece which makes them a little pricey when giving them away as gifts. I did find some usable bottles at World Market yesterday but I didn’t think they were as cute as these. I’ve just updated the Amazon link to show all available sellers – some are selling for less. I can’t find it cheaper elsewhere right now – which is odd, because they’re usually more like $4-5. :( Maybe the price will go back down in a few days. try a search for wine or beer making supplies. I found these same size bottles only with a twist top for $11.50 a dozen. You can also get seals in several colors for about $1.50 a dozen. This will make the bottles look very nice for gift giving. Instead of expensive glass flasks I purchased multiple pints and just used the flask bottle that comes free w/ the purchase. Pour out the vodka & refill. I looooveee this! I am always coming up with my won concoctions too! I’m not sure, but I’ve kept it for 3-4 weeks without it making me sick. I started as you did with cutting up my large pieces of marshmallow and putting them in a French Press, then pouring in an entire bottle of vodka. After a few hours, the marshmallows were totally soggy and melted into slush. So I decided to take it all and put it into my Vitamix and give it a whirl on a low setting for a few seconds. Bam! Totally dissolved ALL the marshmallows. I let it sit the rest of the night and there was little separation. Oooooh, that’s a good idea! I was wondering what it would be like if you toasted the marshmallows first??? That’s a freaking awesome idea. I think at least some of the toasty flavor might come through. Now I have a new project to do!